This PDF 1.5 document has been generated by Microsoft® Word 2010, and has been sent on pdf-archive.com on 15/02/2016 at 04:31, from IP address 114.76.x.x. The current document download page has been viewed 293 times. File size: 472 KB (26 pages). development, crises, and restructurings of capitalism, from its origins to the present? what is—and what is not—valuable. For capitalism, the choice has been clear, and peculiar. many bushels can be grown on a hectare (or furlong, or mu) of land. alternatives to, capitalism’s law of value. the decisive metric of wealth and competitive fitness under capitalism? Cheaps. The law of value in capitalism is a law of Cheap Nature. be fragmented, that its moments can be valued through calculations of price and value. eastern Europe to East Asia. even commodity production and exchange as a whole. These are crucial and indispensable. power, and culture operate within value’s gravitational field, and are co-constitutive of it. In other words: Value does not work unless most work is not valued. and its substance (abstract social labor) depend upon value-relations that configure wagelabor with its necessarily more expansive conditions of reproduction: unpaid work. capital and the production of value. these patterns cohere—and diverge—through definite relations of power and production. My argument emerges from three observations. if partial, transformation of nature into simplified spaces, such as cash-crop monocultures. makes, from the logic of capital to the history of capitalism. 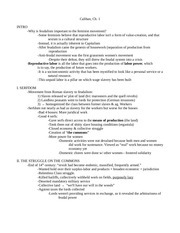 peasant re/production, and so forth—as a fundamental to the rate of exploitation. Nevertheless, value in capitalism remains peculiar and arbitrary—but historically patterned. service to advancing labor productivity. and more extra-human nature attaches to every quantum of socially necessary labor-time. Fewer people produce more: more calories, more shoes, more cars, more stuff. nature (including human nature), so long as external supplies can be secured. after 1450 may be understood in this light, as we see in Chapter Seven. organization, technical deployment, and landscape discipline. Never before had any worldecological regime moved so fast, so far. Something decisive had changed. logic of capital to the history of capitalism. productively, the “how” of capitalism-in-nature? all, controlled in ways that eased the endless accumulation of capital. humans from the rest of nature. essential to creating forms of Cheap Nature specific to capitalism. one that takes the law of value as a co-production of humans bundled with the rest of nature? wage-work; and in the form of fossil fuels produced through biogeological processes. the present and accumulated over time. to the capital-relation.39 Marx’s reading of value was, in other words, eminently postCartesian. historical condition for socially necessary labor-time is socially necessary unpaid work. This file has been shared by a user of PDF Archive. Document ID: 00339933.